Okay, so it is not unusual for the sun to shine in Brasilia. But for the sun to shine inside a courthouse is a truly rare phenomenon. But trust me, that is what happened on August 31. The second day of the Supreme Federal Court's asbestos hearings took place last Friday. That was the day allocated for testimony from international as well as Brazilian expert witnesses; the first day of hearings (August 24, 2012) had been reserved exclusively for Brazilian experts (See: Tomorrow in Brasilia). At stake was the future of the asbestos industry in the world's third largest producer of asbestos. Also at stake was the health of millions of people in Brazil and elsewhere whose lives would be endangered by exposure to Brazilian asbestos. 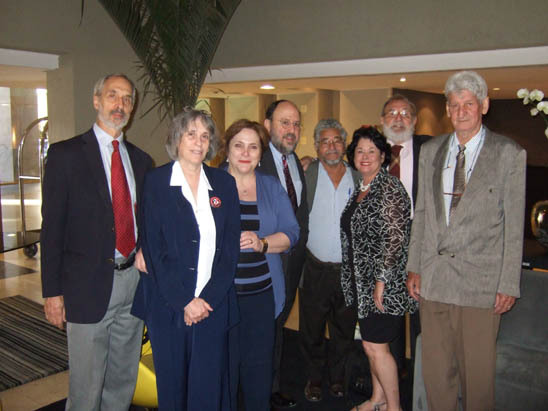 Ban asbestos experts and supporters pictured before leaving for the court. I will be honest. The idea of coming face to face with Brazil's asbestos mafia was not something which filled me with eager anticipation. As we drove up to the Supreme Court at 7:30 a.m. we saw a few dozen protestors with banners and tee shirts expressing support for their employers, the owners of the Canabrava chrysotile mine. By the time we arrived at the Court, a short queue had formed. Security procedures were tight, as to be expected. Not knowing the allegiances of the people surrounding you was disconcerting. Was the man with the red tie an asbestos enforcer? What about the woman in the brown suit  was she an industry lobbyist? The elegant blonde in a short white skirt and rhinestone belt didn't look like a usual ban asbestos campaigner but how could you know. As we entered a courtroom on the first floor, with a capacity of 150+, we were told that the three blocks of seats had been divided as follows: the supporters of the ban on asbestos, including ABREA (the Brazilian asbestos victims association), the Prosecutors Association (ANPT), the Labour Judges Association (ANAMATRA), the CUT trade union and others were assigned seats on the left. Our side of the courtroom. The seats on the right were for the asbestos industry and the middle block of seats was for others including people from Brasilit, a company which had formerly produced asbestos materials but now had converted to asbestos-free production. At least, now you knew who was where. 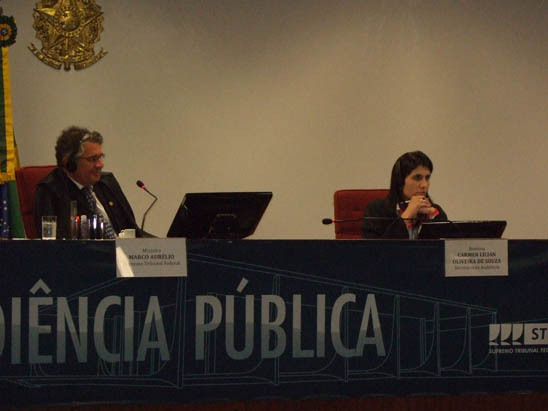 Judges Marco Aurélio and his colleague Carmen Lilian Oliveira de Souza. Facing the courtroom was the judges' bench where Marco Aurélio and his colleague Carmen Lilian Oliveira de Souza sat; alongside them was the Prosecutor Mario Gisi. We were told that while the judges could, of course, make comments and ask questions it was more usual for the Prosecutor to ask witnesses for clarification of their testimony. We could not know just how crucial this would prove to be. The proceedings began punctually at 9 a.m. Each witness was allocated a 20 minute slot. If, by the end of that time, they had not finished they were handed a piece of paper by a court official with, I presume, a request for termination. Headsets for simultaneous translation were provided and while the translators did a great job everything which follows is subject to the proviso that my comments are based on the English language translation. To some extent the experience in the court had much in common with watching a tennis match. The ball seemed to go from one side to the other as the roster of 18 witnesses progressed with the industry's points being expressed by people such as Rosemary Ishii Sanae Zamataro, Milton do Nascimento, Vanderley John,1 David Bernstein (US), Adilson Conceicao Santana, Evgeny Kovalesky (Russia), Thomas Hesterberg (US) and Jack Dunnigan (Canada). Interwoven with the industry propaganda was evidence from independent witnesses who with dignity, intelligence and sincerity made the case for the constitutionality of a Brazilian asbestos ban. Amongst the names which must be recoded on the roll of honor from the asbestos battle in Brasilia are: Medical expert Jefferson Freitas, Zuher Handar from the International Labor Organization, Doracy Maggion (ABREA), Luiz Gonzaga de Mello Belluzo, Barry Castleman (U.S), Fernanda Giannasi, Arthur Frank (U.S.) and Benedetto Terracini (Italy). 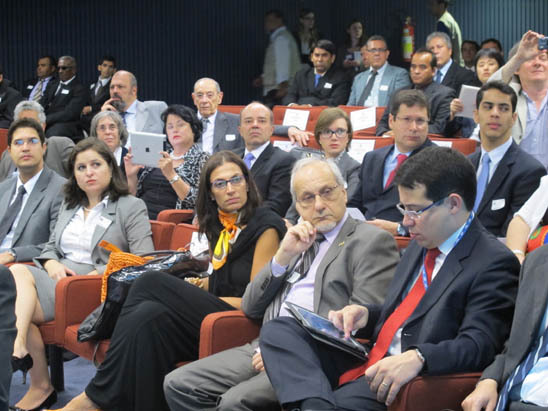 Jefferson Freitas from São Paulo (foreground) and other expert witnesses following the proceedings. And so the sessions proceeded with breaks for coffee and lunch. Speaking for myself, I felt confident that our experts had won the day but, as with all judicial processes, you cannot be certain until the final judgment is handed down (probably in October 2012). Nevertheless I take great comfort from the final comments made by Prosecutor Gisi. Acknowledging the presentation made on behalf of the asbestos workers from Minaçu and paying tribute to their desire to do an honest job, the Prosecutor pointed out that it was not possible to ensure that the 98% of asbestos used in Brazil for civil construction was adequately handled. The same goes for asbestos already incorporated into the national infrastructure as well as asbestos waste. It is common to see asbestos materials being inadequately handled especially by poorer workers, he said. Gisi then told a joke. He said the situation which had been revealed during the asbestos hearings reminded him of the story about a man who sees his wife going into a hotel with another man and says This doubt is killing me. The implication of this being, there is no doubt. The laughter generated by this joke soon became something else as the Prosecutor proceeded to discredit the defences mounted by asbestos stakeholders. 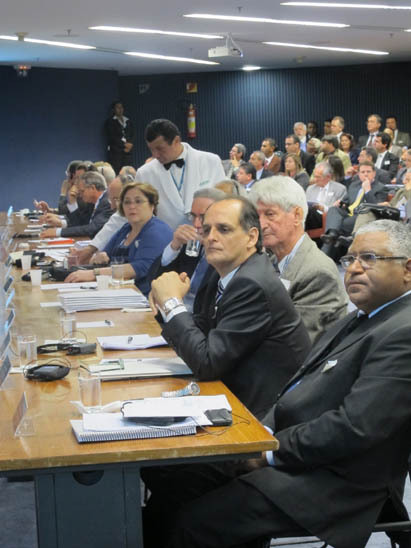 The crescendo of noise by asbestos industry representatives as Gisi criticized the testimony of their witnesses led to an admonishment by Judge Aurélio who demanded silence. Gisi condemned the asbestos industry's harassment of researchers for publishing the results of their work; the lawsuit brought against Hermano Albuquerque de Castro from Fiocruz was mentioned. A variety of working practices at the chrysotile asbestos mine, including the use of explosives, revealed environmental hazards as did the creation of tonnes of asbestos-containing residue produced by the mining operations, he pointed out. As there are few landfills to which toxic waste can be sent in Brazil, the safe disposal of this material is problematic. Gisi confirmed the importance of the positions taken by the World Health Organization and the International Labor Organization on asbestos: all types of asbestos are hazardous. Substantiating this point, Gisi referred to the presentation by the ILO's Zuher Handar who vehemently condemned the use of asbestos. Eternit and SAMA, leading Brazilian asbestos companies, were singled out for censure over their lack of environmental and social commitment; the hazardous conditions in the town of Bom Jesus Da Serra, where an abandoned asbestos mine and the environmental catastrophe it caused remain unremediated, was highlighted by the Prosecutor. Who is responsible for this giant liability, Gisi asked. As for industry's argument that Brazil's economy would suffer irreversible harm from an asbestos ban, the Prosecutor said that a decrease in asbestos-related health costs, now borne by society and the government, would be anticipated following the end of asbestos use. Furthermore, he added, at the many companies which by now had replaced asbestos technology with safer processes, there had not been mass unemployment. Concluding his remarks, Prosecutor Gisi recalled the testimony made on August 24 by Eduardo Algranti from Fundacentro, São Paulo regarding Brazil's responsibility to populations in developing countries. Dr. Algranti, said Gisi, was embarrassed, about the environmental racism posed by sending a known toxin to countries where there are no environmental controls. As Prosecutor Gisi relaxed back into his chair, Judge Aurélio thanked the witnesses for their contributions to the hearings and the members of the audience for their attention. The incredible summing-up by Prosecutor Gisi was more than enough to make my day but there was more to come. Word was received that Ayres Britto, the President of the Supreme Court, would receive members of the ban asbestos delegation in his chamber that evening. During the half-hour we spent with the President, I was given the opportunity to present him with a copy of the CUT translation of the IBAS monograph: Eternit & The Great Asbestos Trial. The judge expressed interest in the Italian proceedings and accepted an autographed copy of the text. With all that happened on August 31, I am optimistic that the Supreme Court of Brazil will uphold the constitutionality of banning asbestos. When they do, Brazil's asbestos industry will finally be recognized as the immoral enterprise it undoubtedly is. 1 Where no country is indicated for the expert witnesses, the speakers were Brazilian.